This past Saturday, my sister and I held our annual Christmas Cookie Exchange party. It’s a good excuse to get our friends together and we always ask everyone to bring 36 of one type of cookie (or treat – not everyone makes cookies!) I always joke that I treat my friends like fourth graders because I also have games and give out prizes! 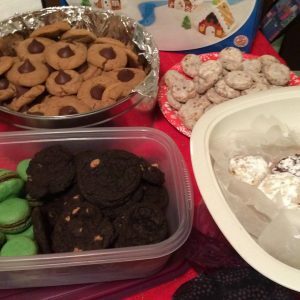 Christmas Cookie Exchange – The Food! In the above photo you can see the Christmas Crack Toffee that I made. I’d had it before but never made it myself, and it was so amazing. Seriously. We let my sister-in-law have some and she went and made her own right away. Super easy to make, and it goes over well. I used the recipe here. The cookies behind that, with the little trees, are something a friend of mine brought…but I’m pretty sure his girlfriend put them together. They are those cut and bake cookies with icing between two of them and some fun icing on the sides. They are so yummy; I might need to steal this idea in the future. Another friend brought peanut butter blossoms which I absolutely love. Those are what I normally make, so it was great that someone else still brought some. Then someone made chocolate mint macrons which were super yummy, and I’m impressed how well they look. Plus, they are a really cute and handy size! There were some other great cookies too like the ones my sister made, though I’m blanking on the actual name. Along with all of the cookies, we had salsa and tortillas, chips and dip, salami roll-ups, another friend made a sausage dip with tortillas, and crock-pot meatballs. Most people tend to just eat this stuff and bring their share of the cookies home, though we always dip into one or two. The friend who made the peanut butter blossoms had extras she put out so we could eat them during the party. Great idea, huh? 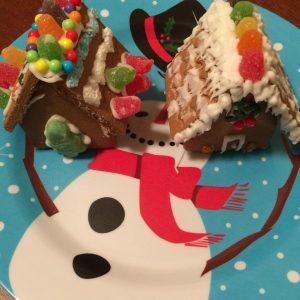 Christmas Cookie Exchange – The Games! I love throwing parties, especially ones with themes, but these days I don’t do it as often. However, my go-to for finding games is Pinterest. It’s usually just trivia questions or something similar, but they are fun. I always make sure to bring lots of pens too of course! I had four total, so I made sure to have four prizes. You couldn’t win more than one prize, even if you technically won multiple games…we just went to the next winner. 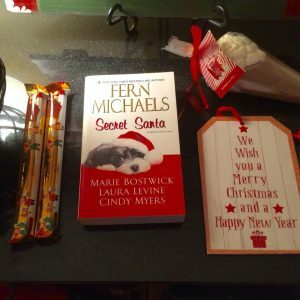 Christmas Cookie Exchange – The Prizes! The prizes were as follows: Two Lindt Chocolates, a book of Christmas short stories, cocoa (with little white chocolate chips and mini marshmallows included on top), and a cute Merry Christmas/Happy New Year sign. 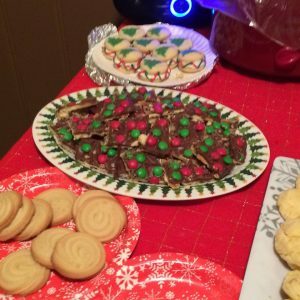 Christmas Cookie Exchange – The Activity! One of my friends actually brought this, but I’m so glad she did because it was fun and it gave us all something specific to do after the games. 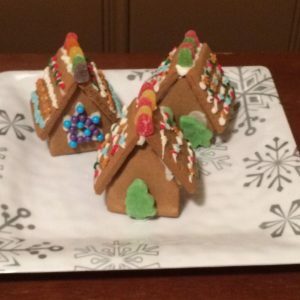 She had two Christmas gingerbread village kits – I think each had four little houses, and six of us were still there to make ours. My house is on the snowman plate on the left. Aren’t they all really cute though? It was a lot of fun putting these together, and laughing as some of our houses wanted to fall apart. I had to redo my whole house with help from a friend before it would stand up and I could decorate! All in all, I think it was a really good night, and it was nice seeing different friends, especially the ones I don’t get to hang out with as often. So tell me, have you ever had a Christmas Cookie Exchange party? If not, would you ever host or attend one? What are your favorite Christmas cookies (or cookies in general if you don’t celebrate Christmas)? My sorority and alumnae group did these all the time. So much fun! And – COOKIES!!!! What fun!!! A bunch of people I work with did this and it was so fun to be a taste tester!! I’m making Christmas Crack this year for my office party, they all go crazy for it. It’s sooo good. I have seen a bunch of cookie exchanges. You do couple things different which I like. Always good to learn something new. I have never felt so hungry in my life reading a blog post LOL That is a fantastic idea! Sounds like fun. I like the idea of a quiz and prizes, not to talk of all the yummy treats on display. I agree that this is a great way of having a good time with friends and family. Edith recently posted: THANKING GOD FOR 2018: DO JOIN ME! This is a timely read for me because we’re trying to do a Christmas cookie exchange at my office and nobody seems to know how to get it started, haha! I will share some of the ideas with everyone! Do you sense me SWOONING and DROOLING over these cookies? Cos I am. I am literally… okay, it’s time to bake. I need cookies! I–okay, this isn’t at all how I planned my comment to be I just got really distracted by the yummy? And now I’m a little frazzled? Anyways, I love the idea of a cookie exchange. I know my friend would be down to do one, but it would probably just be me and her and a dozen different types of cookies. Which is basically any give Saturday evening. Haha! I’m kidding. Mostly. I too love games, the sillier the better. Combine this with cookies and I’m all yours. This looks like such a fun, I love those gingerbread houses. This looks like so much fun! I read about Christmas cookie exchanges in the Moonglow novella series by Deborah Garner but I don’t think it’s a thing in the UK (yet!) so I’ve never actually been to one. Your Christmas cookie exchange sounds like so much fun! I love doing cookie exchanges, both live and virtual. 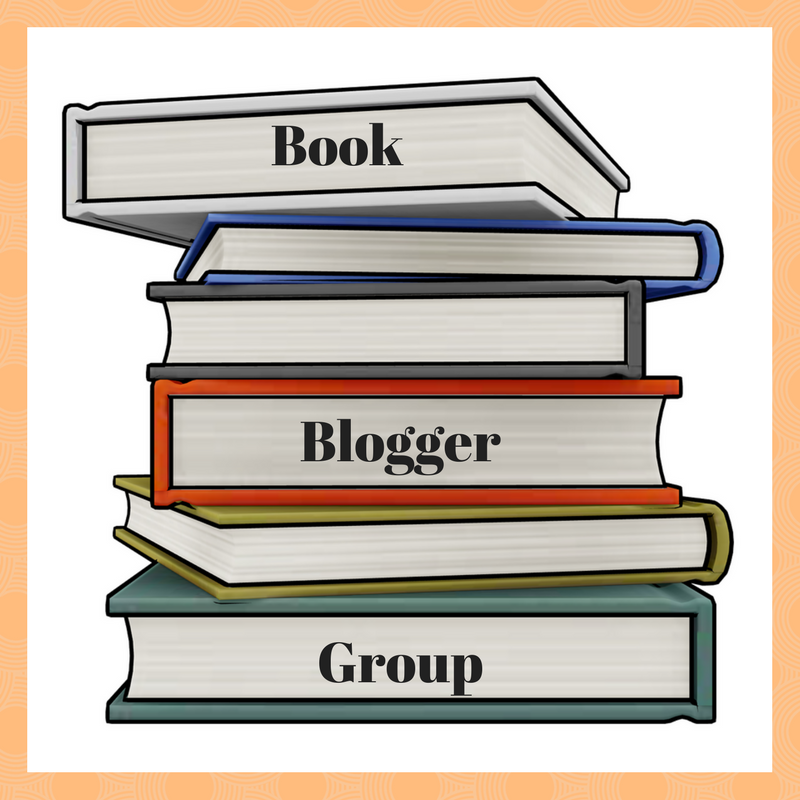 It’s a great way to find some new recipes that you might not have had a chance to try otherwise. One of my favorite cookie exchanges I did, was one where each participant made a traditional cookie from a country they were from/ancestors were from. It was so much fun! A cookie exchange sounds like a great idea. I love baking so it is perfect for me. Might have to do this next year. My inlaws always get me different kind of cookies for Christmas and I love their gift so much, I keep them and eat them for the rest of the Winter season. this looks so fun! I wish I was going to a cookie exchange! maybe I’ll host one next year. We do a cookie exchange at work every year and it’s so much fun! This sounds so fun! 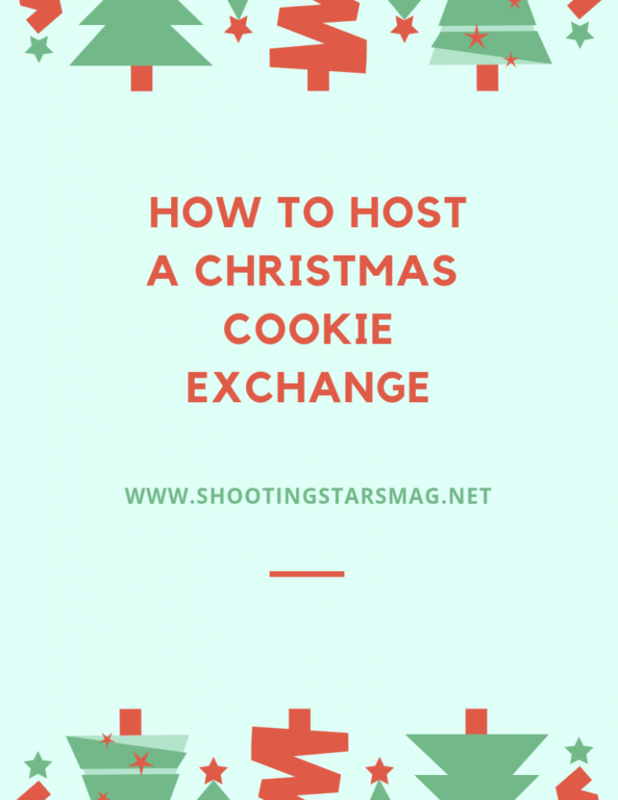 I would love to host a cookie exchange one year! I’ve only been to one party like this before. We kind of just sat around and talked before we did the actual exchanging. But I like the idea of having games! I think this sounds like so much fun! You’ve kind of inspired me to plan something like this for next year!! I’m going to a cookie swap this weekend and I’m excited! I’m going to suggest that we have prizes this year for the best cookies. I used to have a cookie exchange party many years back and miss having it. I need to have it again! I love that you have fun prizes! Ohh, Christmas Crack Toffee sounds yummy! My sons just LOVES toffee, but he’d love it! This is great. I might have to suggest this for our meetup group holiday party next year! I’ve never done a cookie exchange, but this whole thing sounds like so much fun! You don’t have to be in 4th grade to enjoy games and prizes 😉 The cookies all look delicious! I’ve never been to one. They seem…dangerous. lol So many noms!